Types of research papers | What is a research paper? Hello friends, how are you? I am back with on more informative blog to help you with academic stress. So, today I am going to discuss on types of research papers. Yes, you have heard me right. This blog will be a treasure for all those who are doing masters or Ph.D.
A research paper is a toughest and scoring task you get in academic life. It is to judge your knowledge that you have gained throughout the course. A research paper is of vital importance. You cannot take it casually. It almost carries 40 % marks in academics. So it is important to give it equal importance. Students often go for assignment help website for a readymade research paper. This is also good; these companies often provide reliable help to you if you want to write a research paper on your own then read this blog until the end. I am sure you are going to get some great information in it. There are various types of research papers that require a special approach. Every discipline demands a research paper, especially if you are doing post graduation in a subject. No matter if you have got to write a research paper of any type or subject you must know how to present it. Once you get the idea of presenting it, then you will be able to identify the type of research you need to do for the paper. In this blog, you will get the idea of types of research papers that are actually present in the field of academics. But before reading about it, let’s understand in short what a research paper is? As this name suggests, it is a kind of research. You have to do researching, critical thinking, evaluation of source, composition, and organizing all. When you make a research paper, you should be very careful. When you collect the information from various sources, you come in contact with already made researches. You have to read those researches thoroughly. Find out what suits your topic and inculcate that in your paper. You have to analyze it to avoid blunders properly. To put in simple words a research paper is a short explanation of your findings using certain methods for executing the experiment. A research paper/ research article is a research report written within 8 to 12 pages at the maximum. The essence of an original research paper consists of these important parts. It is normally written in 100 words at the maximum which explains what the paper is all about. It gives the background of research and gives a description of the topic of research. A short review is done normally within a paragraph or two which can either be included in the introduction or given in a separate title. The literature review normally concludes by identification of missing links in the research or some extension that is possible. The objective is normally a product or process that is being proposed by the researcher. The proposed methodology describes what the method you are going to execute or what the new product that is to be obtained by which method. By executing the proposed methodology, the observations made are listed in this section. It describes what you learnt from the particular experiment conducted after interpreting the results and giving the concluding remarks for the research. References are an important section for the research paper as you would have considered one of the already published papers to identify the shortcomings in that research or you would have clubbed a process of one outcome with another process and identify the net outcome. So it is important to quote the research articles in your paper where ever necessary. Now, this might be an answer which can be subjective. So follow it according to your research work, different types of research papers may have a bit different manner to start. 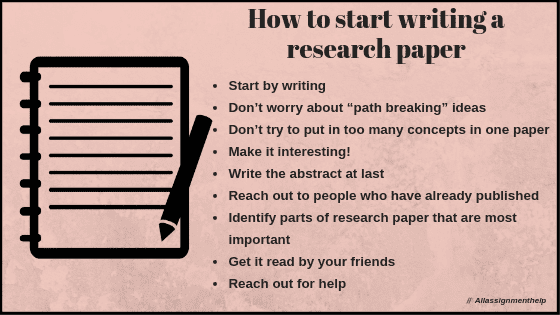 So add these ways along with your own if you have never written a research paper before, its time to write one now. Don’t worry about the best ways because you are on step Zero. Take a first step that is to plan out writing it. Below I am telling you some of the ways or ideas to write a research work. By this I meant, give your research a start now, rather than just thoughts. Writing can help by generating a clear thought process. You will get ideas automatically once you start writing a research paper. Writing will also help you in building up creative ideas and nourishes your brain in a better way. Ideas, especially at early stages, are raw. You will have to spend the time to nourish and develop them. Just start with the idea that can be validated and will be useful. Focus on one simple construct and build your arguments around it. If you put various concepts at once, you will end up in trouble. All your research will become unfocused and unclear. So the best thing is to stick to a particular idea. Academic papers need not be boring. If you want your knowledge to spread around, take the time to construct your narrative in a way that is easy and interesting for readers to grasp the information. Introduce your concept; tell why it’s interesting, the idea, how it works and how it will solve the problem. An original and unconsumed idea is a huge loss to science. Different types of research papers may have different types of writing styles. Choose the one which suits best with your discipline. By the time you are done with your research paper, you will have a better grasp of what you are talking about. It’s far easier to write the abstract at the end than at the beginning. Use your writing as a way to question your own assumptions and inferences. This way your writing can sharpen your content for the better. Understand what it takes to be published. Share your paper with reviewers whom you trust. Usually, we spend a lot of time writing and less time for feedback. Take lesser time writing your content, and more time getting it reviewed. Especially if it’s your first paper, you might spend more time on aspects of the paper that are not important. A good reviewer can help you shape your paper for the better. Yes, all parts are equal, but some are more equal. For example – your idea, its introduction, and the problem you are solving – these areas will have more eyeball views than say details or bibliography. Focus on making the argument strong in these areas. See how easy it is for the information to be grasped and absorbed. Are they getting the idea, the problem? Do they see the solution directly linked to the problem? Presenting your knowledge in an easy and simple way is as important as the idea itself. This is the final option left with many students. You need to look out for online help. There are various online assignment help services available. They help by providing well researched academic papers in quick time. You can get all types of research papers from them. They have expert academic paper writers who are from various disciplines. So after discussing a lot about the definition of a research paper and how to write one. I want to discuss now what research paper is not. This is also equally important to discuss here in this blog. Often students start the research paper writing but end up by mixing it with other types of writing. So read below and understand what research paper is not. It is not just a stock of quotations. Quotations take place only to document or clarify findings. A research paper is not a rewriting or rephrasing of someone’s thoughts and ideas. A research paper is not any description or summary of facts from any internet source or textbooks. A research paper is not emotional persuasion. Vocabulary and sentences that are used in research papers should be neutral. It should be free of emotional language and superlatives. What are the types of research papers? An analytical research paper is about raising a question. Also, put attention in the thinking involved when answering the question. Such papers start by describing the question and finding of the elements to answer it. In this type of research work, first, you need to collect the information. This information is from various other researches. After getting information, now you have to make a personal conclusion about the topic. One thing which you kept in mind while writing an analytical research paper is neutrality. Your paper should not show any negative or positive stance on the matter. If you want to show your perspective or agree or disagree with something, then choose persuasive research paper type. Your persuasive type of research paper follows the below given method. Persuasive paper writing is focused on getting the readers to your side. You keep your point of view or argument and want readers to agree with it. Different types of research papers have different approaches. Persuasive research is totally different from an analytical research paper. An analytical paper is based totally on facts, but Persuasive is based on emotional approach. But it does not mean that it will not follow logical facts. Your research should be based on logical facts and statistical data. While making a persuasive research paper, a researcher will describe the event or object with two opposing viewpoints. Then further analyze the pros and cons and choose a certain opinion. A researcher will either write for or against the specific viewpoint. Then he will give his argument with supportive facts and tries the reader to agree with him/her. The two types of research papers mentioned above are the main types. Other than these two types, there are various types of research papers, such as cause and effect, experimental, survey, problem-solution, and report types. Following methodology is used for Cause and effect research paper. When you write a cause and effect paper, you should remember to answer two main questions: “Why?” and “What?” These two reflect effects and causes. You should not mix several causes and effects, as it may lose the main focus. Method for an experimental research paper is given below. When you write an experimental paper, describe the experimental case in detail. An experimental research paper is written for biology, chemistry, physics, psychology, and sociology. The aims of the experiments are to describe some causation or predict a phenomenon with certain actions. In this research paper, you need to describe your experiment. You need supporting data and experiment analysis. Method to adapt while writing a survey research paper. A survey research paper is for subjects like sociology, psychology, marketing, public health, business, and advertising. You need to conduct a survey in this, where you have to ask questions from the respondents. This helps in analyzing behavior in certain conditions. Methodology to adopt while making this kind of research. Problem-solution research papers are written by students as well as scholars. The aim is simple, solving certain problems. But to solve a problem, then the researcher first needs to analyze it and find a possible solution. After finding a solution, prove its effectiveness with evidence. A method you should follow while writing a report paper. This type of research paper making is comparatively easy from other types of research papers. While writing a researcher has to go through with the information on a particular event or topic. After this researcher aims to inform readers about the main facts of the topic. You need not to use your own information; all work is done within the text you have read. So after you have read about different types of research papers, you may get a clear cut idea of writing one. Whatever your subject is, above mentioned types cover all the academic research papers. If you still face any difficulty in writing any one of them, take assignment help online and get work in time. Now summing up all things, I would make a quick recall about the things which we have discussed in this blog. I started with the explanation of Research paper. Then next I have discussed the important parts on which you need to focus while writing a research paper. Thirdly, this blog told you about how to start writing a research paper. In that part, I have written various points which will guide you when you start your work. Fourthly, you will read about what is not research paper. In this section, I have told you the difference between a research paper and other types of academic writings what you should not write in a research paper. Then the next fifth section talks about the types of research papers. You will get a better understanding of the different types of research papers. All types follow a different methodology. While making a research paper, you should know what kind of approach you need. I hope this blog will help you in a better way and please provide feedback in comments. Your feedbacks are of utmost importance. They will help in writing improved content. So do not wait much if you are in search of academic help. Visit us, and get the best help. Thank you for reading.